The 10 Best Boat Rentals in Iowa! If you happen to be in the state of Iowa, not only is there an abundance of scenic lakes and rivers to explore, but there are plenty of boat rental locations to help you do so. From the great lakes of western Iowa to the mighty Mississippi on the eastern border, there’s something out there to suit your preference. 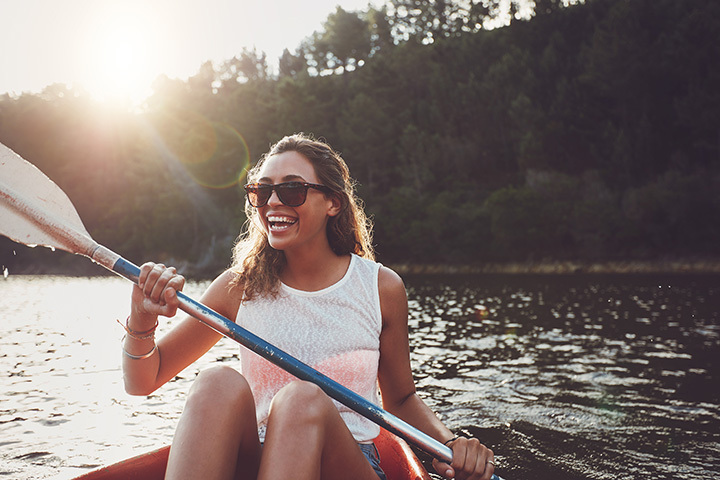 Rent everything from a kayak to a motorboat at these 10 awesome boat rental companies in the state! With over 11,000 acres of water to explore, and endless amounts of shoreline to push off from, Rathbun Lake and the corresponding Honey Creek State Park is a boating adventure capital of Iowa. With so much to do and explore via watercraft vehicle, the state-run resort offers plenty of different ways to get on the water. Every overnight stay at Honey Creek resort comes with complimentary access to stand-up paddleboards and kayaks, as well as jet skis and pontoon boats seasonally. Whatever way you want to get on the water of Rathbun Lake, Honey Creek State Park has a solution for you. To get those motor boats revving on Clear Lake, the first stop you should make is to Clear Lake Boats found not too far from the shore. Featuring wave runners and 16-passenger, double-decker pontoon boats, if it has a motor, and it belongs on the water, you can probably rent it from Clear Lake Boats. With affordable rental pricing, the fun doesn’t ever have to stop at Clear Lake, and with the optional stand-up paddleboards also available, any type of experience you’re looking for at Clear Lake can be found with Clear Lake Boats. With a beautiful backdrop and clean, inviting waters, Saylorville Lake located in Polk City is one of the most popular lake spots in Iowa. At the center of all this action is the Saylorville Lake Marina, which not only provides places to dock and amenities to refill your gas tank and appetite, but also provides boat rentals throughout the season. Featuring six different boat rental options, including stand-up paddleboards and 12-passenger pontoon boats, the Saylorville Lake Marina can provide you everything you need for a fun day on the lake. Serving as the largest lake in Iowa, and a rich heritage and cultural destination, Lake Red Rock attracts all types of water vehicles throughout the year. If you find yourself without a boat this summer, the good folks at the Red Rock Marina have just the solution for you. Featuring a full line of boat rentals ranging from personal kayaks to 20-foot pontoon boats, all rentable for a reasonable price, the Red Rock Marina provides easy access to enjoy the waters of Lake Red Rock. All boats are rentable by the hour, and by the week if you’re looking for an extended boating vacation. When the phrase “boating in Iowa” comes up, many first thoughts lend towards Lake Okoboji in northwest Iowa. Serving as one of the greatest of the Iowa Great Lakes, Lake Okoboji is a tourist friendly water source lined with many recreation attractions ranging from nearby amusement parks to first-class restaurants. Enjoying the waters of Lake Okoboji is an easy endeavor, especially with the help of Boat Okoboji Rentals. They will not only provide the equipment, but give you the quick rundown on how to operate their available boat rentals. If you already own a boat, but want to try out some new toys like wakeboards, tubes or skis, then Boat Okoboji has you covered there too. The first place to turn to when considering putting a pontoon boat onto the Coralville Reservoir should be the Coralville Lake Marina located in Iowa City. Featuring a full line of pontoon boats available to rent by the hour, the Coralville Lake Marina is happy to work with you and your schedule to make any Coralville Lake outings a reality. If you are looking to get a motor onto the waters of Lake Panorama, your best bet is to go through Interra Properties. Offering both pontoon boats and speed boat rentals, the affordable hourly rate from Interra Properties can keep you floating on top of the water all afternoon long. To really add another dimension to your Lake Panorama boating experience, Interra Properties also provides available vacation home rentals, which could serve as the perfect basecamp for a weekend on the water. Featuring paddleboards, paddle boats, canoes, kayaks and pontoon boats, the options are nearly endless in the ways to enjoy the waters of Lake Macbride with Lake Macbride Boat Rentals. Whether you are looking to do a little fishing, or you simply want to enjoy Lake Macbride State Park with some paddle strokes, the affordable rates and accommodating service of the Lake Macbride Boat Rentals can provide what you are looking for. Featuring both rentals and sales, whether you are looking for a fun day out on the water or a long-term investment, the Big Creek Marina has a lot to choose from. Featuring your standard boat inventory including canoes, kayaks and pontoon vessels, Big Creek Marina also offers hydro-bikes, sailboats and electric Crag Cats for you to enjoy. With so many options to choose from, and plenty of water to explore, the Big Creek Marina should be your first stop on any Big Creek adventure. For a little more accommodating of a ride, S&S Houseboat Rentals out of Lansing has just the right thing for you. With four different houseboats to choose from, with each sleeping at least 10 people and featuring a spacious interior, S&S houseboat rentals are the way to go if you want to spend a comfortable night on the water. Outside of the houseboats, S&S also features pontoon and fishing vessels, so no matter what kind of adventure you are looking for on the Mississippi River, S&S can help accommodate.